Forty two hectares, two brothers... one passion. Malvirà was established in the 1950s by Giuseppe Damonte, at a time when the Roero's potential was yet unrealized. Giuseppe had a great passion for farming and wine, a passion that he passed on to his two sons, Roberto and Massimo. Malvirà wines are produced from Estate fruit, organically farmed across 104 acres and 6 vineyards. Over the years, they have been one of the most ardent proponents of the Arneis grape. 42 of their 104 acres are devoted to the propagation of Arneis. It is the wine for which Malvirà is renowned. 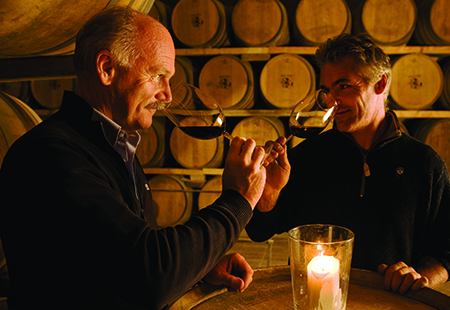 In 2007, the Damontes purchased the Renesio vineyard, which they leased since 1983. Renesio is the cru from which the Arneis grape was identified in 1478. In fact, it is unknown which came first, the name of the vineyard, or the name of the grape! Malvirà's Estate spans 104 acres and 6 primary vineyards including Trinità, Renesio, Saglietto, San Michele, San Guglielmo, and Mombeltramo. All vineyards are farmed organically. The Roero was at one time completely immersed by the sea. Its many soil types are distinguished by this geological history. Generally speaking there is more oceanic sedimentary and sandy soil found in the Roero, as compared to the neighboring parts of the Langhe (Barolo and Barbaresco). It is not uncommon to find fossilized shells in vineyards. The Trinità vineyard is sedimentary in nature with a high portion of sand. The upper part of the south‐facing slope is planted to Nebbiolo, where the grape can ripen to its fullest potential. The lower part of the hill is planted to Arneis. The Renesio vineyard is rich in calcareous marl and planted with Arneis and Nebbiolo. Saglietto is contiguous to Renesio and shares similar soils, though with a bit more clay resulting in a denser wine. It is planted exclusively to white grapes, including Arneis and Favorita. San Michele has calcareous clay soils and is planted with Barbera. San Guglielmo, the family's most historic vineyard, borders Trinità and shares its sedimentary sandy soils and affinity for red grapes, including Nebbiolo and Barbera.